For other Thoroughbred Triple Crowns, see Triple Crown of Thoroughbred Racing. Justify, the 13th winner, at the 2018 Preakness Stakes. In the United States, the Triple Crown of Thoroughbred Racing, commonly known as the Triple Crown, is a title awarded to a three-year-old Thoroughbred horse who wins the Kentucky Derby, Preakness Stakes, and Belmont Stakes. The three races were inaugurated in different years, the last being the Kentucky Derby in 1875. These races are now run annually in May and early June of each year. The Triple Crown Trophy, commissioned in 1950 but awarded to all previous winners as well as those after 1950, is awarded to a Triple Crown winner. The first winner of all three Triple Crown races was Sir Barton in 1919. Some journalists began using the term Triple Crown to refer to the three races as early as 1923, but it was not until Gallant Fox won the three events in 1930 that Charles Hatton of the Daily Racing Form put the term into common use. In the history of the Triple Crown, 13 horses have won all three races: Sir Barton (1919), Gallant Fox (1930), Omaha (1935), War Admiral (1937), Whirlaway (1941), Count Fleet (1943), Assault (1946), Citation (1948), Secretariat (1973), Seattle Slew (1977), Affirmed (1978), American Pharoah (2015), and Justify (2018). As of 2018, American Pharoah and Justify are the only living Triple Crown winners. James E. "Sunny Jim" Fitzsimmons was the first trainer to win the Triple Crown more than once; he trained both Gallant Fox and his son Omaha for the Belair Stud breeding farm. Gallant Fox and Omaha are the only father-son duo to win the Triple Crown. Bob Baffert became the second trainer to win the Triple Crown twice, training American Pharoah and Justify. Belair Stud and Calumet Farm are tied as the owners with the most Triple Crown victories with two apiece. Calumet Farms won with Whirlaway and Citation. Eddie Arcaro rode both of Calumet Farms' Triple Crown champions and is the only jockey to win more than one Triple Crown. Secretariat holds the stakes record time for each of the three races. His time of 2:24 for ​1 1⁄2 miles in the 1973 Belmont Stakes also set a world record that still stands. The three Triple Crown races had been run for decades before the series received its name; the Belmont Stakes was first run in 1867, the Preakness in 1873, and the Kentucky Derby, in 1875. The term was in use at least by 1923, although Daily Racing Form writer Charles Hatton is commonly credited with originating the term in 1930. Their order has varied. Before 1931, the Preakness was run before the Kentucky Derby eleven times. On May 12, 1917, and May 13, 1922, the Kentucky Derby and Preakness were run on the same day. Since 1931, the Kentucky Derby has been run first, followed by the Preakness, and then the Belmont. Each Triple Crown race is open to both colts and fillies. Although fillies have won each of the individual Triple Crown races, none has won the Triple Crown itself. Despite attempts to develop a "Filly Triple Crown" or a "Triple Tiara" for fillies only, no set series of three races has consistently remained in the public eye, and at least four different configurations of races have been used. Two fillies won the series of the Kentucky Oaks, the Pimlico Oaks (now the Black-Eyed Susan Stakes), and the Coaching Club American Oaks, in 1949 and 1952, but the racing press did not designate either accomplishment as a "Triple Crown". In 1961, the New York Racing Association created a filly Triple Crown of in-state races only, but the races changed over the years. Eight fillies won the NYRA Triple Tiara between 1968 and 1993. Gelded colts may run in any of the three races today, but they were prohibited from entering the Belmont between 1919 and 1957. Geldings have won each of the individual races, but like fillies, no gelding has ever won the Triple Crown. The closest was Funny Cide, who won the Derby and the Preakness in 2003. All the races are held on dirt tracks, rather than the turf commonly used for important races in Europe. "The Run for the Black-Eyed Susans"
"The Test of the Champion"
† During his 2018 bid for the Triple Crown, Justify used the colors of WinStar Farms (white, green and black star) for the Kentucky Derby and Preakness Stakes. The colors of China Horse Club (red, yellow stars and sleeves) were used in the Belmont Stakes. At completion of the 2016 season, the three Triple Crown races have attracted 4,224 entrants. Of these, 292 horses have won a single leg of the Triple Crown, 52 horses have won two of the races (23 the Kentucky Derby and Preakness Stakes, 18 the Preakness Stakes and Belmont Stakes, and 11 the Kentucky Derby and Belmont Stakes), and 13 horses have won all three races. Pillory won both the Preakness Stakes and Belmont Stakes in 1922, a year when it was impossible to win the Triple Crown because the Kentucky Derby and Preakness Stakes were run on the same day. 10 of the 13 winners have been "homebreds", owned at the time of their win by their breeders. Jim Fitzsimmons and Bob Baffert are the only two trainers to have two horses win the Triple Crown, with Fitzsimmons training the sire/son combination of 1930 winner Gallant Fox and 1935 winner Omaha and Baffert training 2015 winner American Pharoah and 2018 winner Justify. The wins by Fitzsimmons were also the first time that an owner and the first time that a breeder, Belair Stud holding both duties, had a repeat win of the Triple Crown. Calumet Farm is the only other owner with two Triple Crown horses, 1941 winner Whirlaway and 1948 winner Citation. Eddie Arcaro is the only jockey to ride two horses to the Triple Crown, both for Calumet, Whirlaway and Citation. Those two horses' trainers, Ben Jones and Jimmy Jones, were father and son. All 13 horses, and most owners, trainers, and jockeys were born in the United States. The exceptions were jockey Johnny Longden, born in England and raised in Canada; French-born jockey Jean Cruguet; trainer Laz Barrera, from Cuba; and jockey Victor Espinoza, from Mexico. Secretariat's trainer, Lucien Laurin and jockey, Ron Turcotte were both Canadians. Owner Fannie Hertz was married to John D. Hertz, who was born in Slovakia; owner Ahmed Zayat was born in Egypt. Jockey Willie Saunders is considered a Canadian jockey because he grew up and established his career there, but was born in Montana. The horse Sir Barton was foaled in the United States but had a Canadian owner, J. K. L. Ross, at the time of his Triple Crown win, while Justify's owners were from both the United States and China. Secretariat holds the stakes record for each of the Triple Crown races, the Kentucky Derby (1:59 2/5), the Preakness Stakes (1:53), and the Belmont Stakes (2:24). At 18, Steve Cauthen became the youngest jockey to win the Triple Crown, riding Affirmed in 1978. At 52, Mike Smith became the oldest jockey to win the Triple Crown, riding Justify in 2018. Only one horse, Alydar, has placed (finished second) in all three races. He was defeated by Affirmed in all three races in 1978 by a combined margin of two lengths. His trainer John Veitch is the only trainer to have done this with one horse. In 1995, D. Wayne Lukas became the first and only major figure (owner, jockey, or trainer) to win all three Triple Crown races with different horses, Thunder Gulch in the Derby and Belmont, Timber Country in the Preakness. Lukas also is the only trainer to have won six straight Triple Crown races, adding his 1995 wins, having won the 1994 Preakness and Belmont with Tabasco Cat and the 1996 Derby with Grindstone. Like Veitch, only with two different horses, Bob Baffert also had second-place finishes in all three legs of the Triple Crown, both owned by Ahmed Zayat: in 2012, Bodemeister finished second in the Kentucky Derby and Preakness stakes to I'll Have Another, then Paynter was entered and finished second to Union Rags. Baffert and Zayat teamed up again for the 2015 Triple Crown victory of American Pharoah. Gallant Fox is the only Triple Crown winner to sire another U.S. Triple Crown winner, Omaha. Affirmed sired Peteski, winner of the 1993 Canadian Triple Crown. Whirlaway, in addition to winning the 1941 Triple Crown, also won the Travers Stakes that year, becoming the first and only horse to date to accomplish that feat. American Pharoah, in addition to winning the 2015 Triple Crown, also won the Breeders' Cup Classic that year. As the Breeders' Cup was not established until 1984, American Pharoah was the first (and, as of 2018, only) horse to sweep all four races, a feat that came to be known as the Grand Slam. After the first Triple Crown winner, Sir Barton, in 1919, there was not another winner until Gallant Fox in 1930, a gap of 11 years. Between 1930 and 1948, seven horses won the Triple Crown, with five years being the longest gap between winners. However, following the 1948 win of Citation, there was a considerable gap of 25 years before Secretariat ended the drought of Triple Crown champions in 1973. Between 1973 and 1978, there were three Triple Crown winners. After Affirmed's Triple Crown in 1978, the longest drought in Triple Crown history began in 1979 with Spectacular Bid's failed Triple Crown attempt at the Belmont Stakes, and lasted until American Pharoah won in 2015. Between 1979 and 2014 thirteen horses won both the Kentucky Derby and Preakness Stakes, but either failed to win the Belmont Stakes or could not start in the race. Of those, Real Quiet came the closest to winning the Triple Crown, losing the Belmont Stakes by a nose in 1998. Spectacular Bid finished 3rd in 1979. Pleasant Colony finished 3rd in 1981. Alysheba finished 4th in 1987. Sunday Silence finished 2nd in 1989. Real Quiet finished 2nd in 1998. Charismatic finished 3rd in 1999. War Emblem finished 8th in 2002. Funny Cide finished 3rd in 2003. Smarty Jones finished 2nd in 2004. Big Brown did not finish in 2008. I'll Have Another did not start (injury) 2012. California Chrome finished 4th in 2014. In the 1979-2015 period, horses who contested all three races, losing the Kentucky Derby but winning the Preakness and the Belmont were Risen Star in 1988, Hansel in 1991, Tabasco Cat in 1994, Point Given in 2001, and Afleet Alex in 2005. In 1984, Swale and in 1995, Thunder Gulch ran all three races, winning the Derby and the Belmont, but not the Preakness. The 37-year gap between the Triple Crown wins of Affirmed and American Pharoah drew criticism of the system. As far back as 1986, reporters noted that horses who were fresh for the Belmont had an advantage. In 2003, Gary Stevens stated in an interview with Charlie Rose that he did not believe there would be another Triple Crown winner because of the tendency for owners to put fresh horses in the Preakness and Belmont Stakes. California Chrome co-owner Steve Coburn was particularly critical of the Triple Crown system in post-Belmont remarks in 2014; he considered the system to be unfair, arguing that there would never be another Triple Crown winner in his lifetime unless only horses that competed in the Kentucky Derby and Preakness competed at the Belmont. By 2014, six of the previous eight Belmont winners had not competed in either of the first two legs of the Triple Crown. Additionally, from 2006 to 2014, the Belmont winner was a horse who had not competed in the Preakness. American Pharoah was the first Belmont winner since Afleet Alex in 2005 to have run all three Triple Crown races. Big Brown, the winner of the Kentucky Derby and Preakness Stakes, at the 2008 Belmont Stakes, where he was pulled up and did not finish. 1944: Pensive was the first horse to contest but lose the Belmont after winning the first two legs. He placed second to Bounding Home,:78 who had neither run in the Derby nor the Preakness. 1958: Tim Tam, defeated by six lengths by Cavan, who had neither contested the Derby nor Preakness. 1961: Carry Back, "sore" after the race, was seventh of nine entries, ​14 1⁄2 lengths behind the winner, a longshot named Sherluck. 1964: Northern Dancer, defeated by Quadrangle. 1966: Kauai King, defeated by Amberoid. 1968: Forward Pass, defeated by Stage Door Johnny by ​1 1⁄4 lengths. 1969: Majestic Prince, second by ​5 1⁄2 lengths to Arts and Letters. Loss attributed to fatigue and lameness. 1971: Cañonero II, fourth in the Belmont to 34–1 longshot Pass Catcher, the loss attributed to a hoof problem. 1979: Spectacular Bid, third in Belmont, was alleged to have stepped on a safety pin the morning of the race, though another theory blamed rider error by an inexperienced young jockey moving him too soon. He finished ​3 1⁄4 lengths behind Coastal and a neck behind the second-place horse, Golden Act. 1981: Pleasant Colony, third in Belmont, ​1 1⁄2 lengths behind Summing and the second-place horse, Highland Blade. 1987: Alysheba finished fourth in Belmont behind Bet Twice, Cryptoclearance, and Gulch. 1989: Sunday Silence, second in Belmont, eight lengths behind Easy Goer. 1997: Silver Charm, second in Belmont, ​3⁄4 length behind Touch Gold. 1998: Real Quiet, second in Belmont after a photo finish, a nose behind Victory Gallop. 1999: Charismatic, third in Belmont, ​1 1⁄2 lengths behind Lemon Drop Kid and second-place Vision and Verse. Charismatic was pulled up soon after the finish, vanned off with a bone fracture. He survived and was retired to stud. 2002: War Emblem stumbled at gate in Belmont, finished eighth out of 11. Winner Sarava scored upset at record odds of 70-1. 2003: Funny Cide, third in Belmont, five lengths behind Empire Maker, and ​4 1⁄4 lengths behind second-place horse, Ten Most Wanted. 2004: Smarty Jones, second in Belmont, one length behind Birdstone. 2008: Big Brown was pulled up in the home stretch of the Belmont, eased to a last-place finish. Winner was Da' Tara. A hoof problem had limited Big Brown's training, and may have been a factor in his defeat. 2012: I'll Have Another was scratched from the Belmont the day before the race due to a tendon injury. 2014: California Chrome finished in a dead heat for 4th in the Belmont after being stepped on by another horse leaving the gate and running the race with an injury to his heel and a scrape on his tendon. Originally, the three races largely organized their own nominations procedure, marketing and television broadcast rights. In 1985, Triple Crown Productions was created when the owner of Spend a Buck chose not to run in the other two Triple Crown races because of a financial incentive offered to any Kentucky Derby winner who could win a set of competing races in New Jersey. The organizers of the three races realized that they needed to work together. Efforts to unify the sponsorship and marketing of all three Triple Crown races began in 1987 when ABC Sports negotiated a deal with Chrysler to pay $5 million to any horse that swept all three races, and $1 million each year there was no Triple Crown sweep to the horse with the highest combined Triple Crown finish. This sponsorship lasted until 1993. The end of the $1 million participation bonus was linked to the breakdown of Prairie Bayou at the Belmont Stakes that year and the uncomfortable situation that arose when the Kentucky Derby winner, Sea Hero, was given the bonus following a seventh-place finish. In 1995, Visa USA took over the sponsorship with a 10-year contract, naming the series the Visa Triple Crown and offering only the $5 million bonus to a horse that could sweep the Triple Crown. Along with sponsorship by VISA, NBC Sports paid $51.5 million for broadcast rights to all three races, with the revenue split giving 50% of the total to Churchill Downs and 25% each to Pimlico and to the New York Racing Association (NYRA). The Visa deal—and the cooperative effort—ended after 2005. The NYRA felt that they did not get a fair share of the revenue, particularly when the Belmont had the highest ratings of all three races in the years where a Triple Crown was on the line. From 2001 through 2013, average viewership for the Belmont was 7 million when the Triple Crown was not at stake, whereas viewership averaged 13 million when it was. [a] With the contract term ending, the NYRA went to ESPN on ABC for the 2006 Belmont, while the broadcasts of the Derby and Preakness remained with NBC. Visa chose to remain as a sponsor of only Kentucky Derby for the next five years. As a result of the divided broadcast, Triple Crown Productions was unable to obtain a new sponsor. In February 2011, ABC/ESPN dropped out of the negotiations to renew broadcast rights to the Belmont Stakes. NBC obtained the contract through 2015, once again uniting all three races on the same network. In 2014, NBC extended their contract for the Kentucky Derby through 2025. As of August 2015[update], NBC obtained a broadcast contract for the Belmont through 2020 and the Preakness through 2022. ^ These were 2002 for War Emblem, 2003 for Funny Cide and 2004 for Smarty Jones. ^ The 1890 Preakness Stakes was held at Morris Park Racecourse in The Bronx, New York. ^ a b c d e f g h i j k l m n o From 1894 to 1908, the Preakness Stakes were held at Gravesend Race Track on Coney Island, New York. ^ a b c d In 1917 and 1922, the Kentucky Derby and Preakness Stakes were held on the same day. ^ a b The 1918 Preakness Stakes was held in two divisions due to a large field. War Cloud won one and Jack Hare, Jr. the other. ^ a b c d e Due to reconstruction at Belmont Park, the Belmont Stakes were held at Aqueduct Racetrack in Queens, New York from 1963 to 1967. ^ Dancer's Image was disqualified as the winner of the 1968 Kentucky Derby due to a post-race failed drug test. ^ I'll Have Another was scratched the afternoon prior to the Belmont due to tendonitis and was unable to attempt to win the race. [Fy] Denotes a filly. Fillies won the Kentucky Derby in 1915, 1980, and 1988, Preakness Stakes in 1903, 1906, 1915, 1924, and 2009, and Belmont Stakes in 1867, 1905, and 2007. RNR Race not run. The Belmont was not run in 1911 and 1912 due to anti-betting legislation passed in New York State. The Preakness did not run 1891–1893. Wikimedia Commons has media related to The Kentucky Derby, Preakness Stakes and Belmont Stakes. ^ "Secretariat remains No. 1 name in racing". ESPN. Retrieved July 22, 2015. ^ a b c d e f g h i Christine, Bill (June 4, 1989). "The Spoilers: Last Jewel of Triple Crown Has Been Stolen 11 Times--Will Sunday Silence Be Next Victim of an Upset?". Los Angeles Times. Retrieved June 2, 2015. ^ Liebman, Bennett (April 24, 2008). 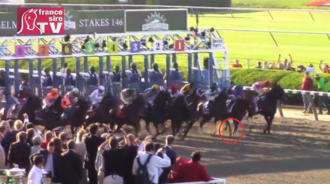 "The Rail: The Race for the Triple Crown - Origins of Triple Crown". The New York Times. New York, NY. Retrieved May 9, 2009. ^ "History & Tradition of the Triple Crown". OD Action. Retrieved August 5, 2013. ^ Beyer, Andrew (June 12, 2007). "Where Are the Fillies?". Washington Post. Retrieved October 27, 2015. ^ Genaro, Teresa (June 7, 2011). "The Triple Tiara". Hello Race Fans. Retrieved October 27, 2015. ^ Drape, Joe (June 1, 2003). "Where No Gelding Has Gone Before". New York Times. Retrieved October 27, 2015. ^ "History: Horses". Belmont Stakes. Archived from the original on 2 December 2015. Retrieved 27 October 2015. ^ Kane, Mike (June 6, 2014). "10 things to know about the Triple Crown". Courier-Journal. Retrieved October 27, 2015. ^ Drager, Marvin. "Kentucky Derby". Encyclopædia Britannica. Retrieved May 29, 2015. ^ Drager, Marvin. "Preakness Stakes". Encyclopædia Britannica. Retrieved June 13, 2015. ^ "The Preakness Stakes". Triple Crown Productions. Archived from the original on May 30, 2015. Retrieved May 29, 2015. ^ Drager, Marvin. "Belmont Stakes". Encyclopædia Britannica. Retrieved May 29, 2015. ^ "Belmont Stakes". Triple Crown Productions. Archived from the original on May 30, 2015. Retrieved May 29, 2015. ^ "Belmont Stakes History". Belmont-Stakes Info. Archived from the original on May 30, 2015. Retrieved May 29, 2015. ^ "Triple Crown Winners". The New York Racing Association. June 8, 2015. Retrieved June 10, 2018. ^ Angst, Frank (June 10, 2015). "The Figs: American Pharoah's Triple Crown". Blood-Horse. Retrieved June 11, 2015. ^ "Sham: In the Shadow of a Superhorse". California Thoroughbred. Retrieved May 24, 2012. ^ Hegarty, Matt (June 19, 2012). "Secretariat awarded Preakness record at 1:53 after review". Daily Racing Form. Retrieved June 19, 2012. ^ Christine, Bill (December 29, 2011). "10 most unbreakable records (10-6)". Daily Racing Form. Retrieved June 11, 2015. ^ "2012 Kentucky Derby -- I'll Have Another rallies to win at Churchill Downs - ESPN". ESPN.com. Retrieved October 3, 2014. ^ "Canadian Triple Crown Winner Peteski Dies from Colic". BloodHorse.com. April 8, 2001. Retrieved August 11, 2010. ^ "The Courier - Google News Archive Search". Retrieved October 3, 2014. ^ Charlie Rose (July 21, 2003). "A rebroadcast of a discussion about the film Seabiscuit". Charlie Rose. Archived from the original on September 13, 2012. ^ "Brennan: Cherry-pick races and Triple Crown extinct". USA Today. Retrieved June 8, 2014. ^ "Betting against California Chrome? Fresh horses typically win Belmont Stakes". Newsday. Retrieved October 3, 2014. ^ ESPN News Service (June 6, 2015). "American Pharoah claims first Triple Crown since 1978". ESPN. Retrieved June 6, 2015. ^ a b c Drape, Joe (2008). To the swift : classic Triple Crown horses and their race for glory (1st ed.). New York: St. Martin's Press. ISBN 9780312357955. ^ Drager, Marvin. "Majestic Prince". Encyclopædia Britannica. Retrieved June 2, 2015. ^ Glauber, Bill (May 19, 1991). "Canonero II came close to Triple Crowning glory". Baltimore Sun. Retrieved June 2, 2015. ^ a b c d Staff (June 1, 2015). "American Pharoah Eyes Triple Crown Sweep". The New York Times. Retrieved June 3, 2015. ^ Oakford, Glenye Cain (September 17, 2011). "Spectacular Bid, 27, dead". Daily Racing Form. Retrieved June 2, 2015. ^ Hovdey, Jay (May 31, 2012). "Triple Crown near-misses: Pleasant Colony, 1981". Daily Racing Form. Retrieved June 2, 2015. ^ Finn, Robin (June 7, 1987). "BELMONT STAKES; On Bumpy Road to Crown, Alysheba Is Left Behind". The New York Times. Retrieved June 3, 2015. ^ Durso, Joseph (June 8, 1997). "Touch Gold Sneaks In to Steal Silver Charm's Crown". The New York Times. Retrieved June 3, 2015. ^ Durso, Joseph (June 7, 1998). "THE 130TH BELMONT STAKES; Victory Gallop's Charge Keeps Real Quiet Short of Posterity". The New York Times. Retrieved June 3, 2015. ^ Durso, Joseph. "HORSE RACING; Charismatic's Bid Ends in Injury and Defeat". The New York Times. Retrieved June 2, 2015. ^ Drape, Joe (June 9, 2002). "Early Stumble Dooms War Emblem's Triple Crown Bid". The New York Times. Retrieved June 3, 2015. ^ Drape, Joe (June 8, 2003). "Empire Maker Ends Funny Cide's Triple Crown Bid". The New York Times. Retrieved June 2, 2015. ^ Drape, Joe (June 6, 2004). "At Smarty Jones's Coronation, Birdstone Makes Off With the Crown". The New York Times. Retrieved June 3, 2015. ^ Beyer, Andrew (June 11, 2008). "The Story Behind Big Brown's Bad Belmont May Never Be Known". Washington Post. Retrieved June 2, 2015. ^ Claire Novak (June 8, 2014). "'Chrome' Co-Owner Has No Regrets for Comments". BloodHorse.com. Retrieved October 3, 2014. ^ a b c d e f g Paulick, Ray (November 17, 2010). "Selling Triple Crown As A Package Deal". Paulick Report. Retrieved June 13, 2015. ^ "Chrysler to Sponsor Triple Crown Challenge". Ocala Star-Banner. Associated Press. September 24, 1987. Retrieved May 19, 2015. ^ a b Staff (May 2, 2005). "VIsa to End Triple Crown Challenge Sponsorship". Blood-Horse. Retrieved May 19, 2015. ^ Sandomir, Richard (May 19, 2014). "Looking for a Sure Thing in the Belmont Stakes? Bet on NBC". New York Times. Retrieved May 19, 2015. ^ "NBC reaches deal to keep Kentucky Derby rights through 2015". Daily Hampshire Gazette - GazetteNet.com. Associated Press. October 8, 2010. Archived from the original on June 12, 2012. Retrieved May 19, 2015. ^ Sharrow, Ryan (February 22, 2011). "NBC re-ups deal to carry Preakness through 2015". ^ "NBC Signs Five Year Deal To Televise Belmont Stakes". Retrieved October 3, 2014. ^ "New Pact Keeps Kentucky Derby in NBC Stable Through 2025" (Press Release). February 26, 2014. Retrieved May 19, 2015. ^ Liz Mullen (August 10, 2015). "Nbc Sports Group Extends Belmont Contract Through 2020". Sports Business Daily. Retrieved May 8, 2016. ^ a b "Preakness Stakes - History". preakness-stakes.info. Archived from the original on April 13, 2015. Retrieved May 18, 2015. This page was last edited on 16 April 2019, at 15:06 (UTC).